A little background of this wonderful festival, will be celebrating it this coming Sunday! The Mid-Autumn Festival (simplified Chinese: 中秋节; traditional Chinese: 中秋節), also known as the Moon Festival or Mooncake Festival or Zhongqiu Festival, is a popular lunar harvest festival celebrated by Chinese and Vietnamese people. A description of the festival first appeared in Rites of Zhou, a written collection of rituals of the Western Zhou Dynasty from 3,000 years ago. The celebration became popular during the early Tang Dynasty. The festival is held on the 15th day of the eighth month in the Chinese calendar, which is in September or early October in the Gregorian calendar, close to the autumnal equinox. The Government of the People's Republic of China listed the festival as an "intangible cultural heritage" in 2006, and it was made a Chinese public holiday in 2008. It is also a public holiday in Taiwan. 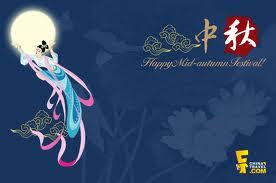 Celebration of the Mid-Autumn Festival is strongly associated with the legend of Houyi, his student Feng Meng, and Chang'e, the Moon Goddess of Immortality. Tradition places these two figures from Chinese mythology at around 2200 BCE, during the reign of the legendary Emperor Yao, shortly after that of Huangdi. Unlike many lunar deities in other cultures who personify the moon, Chang'e simply lives on the moon but is not the moon herself. There are many variants and adaptations of the legend of Chang'e that frequently contradict each other. However, most versions of the legend involve some variation of the following elements: Houyi, the Archer, an emperor, either benevolent or malevolent, and an elixir of life. One version of the legend states that Houyi was an immortal and Chang'e was a beautiful young girl, working in the palace of the Jade Emperor (the Emperor of Heaven, 玉帝 pinyin:Yùdì) as an attendant to the Queen Mother of the West (the Jade Emperor's wife). Houyi aroused the jealousy of the other immortals, who then slandered him before the Jade Emperor. Houyi and his wife, Chang'e, were subsequently banished from heaven. They were forced to live on Earth. Houyi had to hunt to survive and became a skilled and famous archer. At that time, there were ten suns, in the form of three-legged birds, residing in a mulberry tree in the eastern sea. Each day one of the sun birds would have to travel around the world on a carriage, driven by Xihe, the 'mother' of the suns. One day, all ten of the suns circled together, causing the Earth to burn. Emperor Yao, the Emperor of China, commanded Houyi to use his archery skill to shoot down all but one of the suns. Upon completion of his task, the Emperor rewarded Houyi with a pill that granted eternal life. Emperor Yao advised Houyi not to swallow the pill immediately but instead to prepare himself by praying and fasting for a year before taking it. Houyi took the pill home and hid it under a rafter. One day, Houyi was summoned away again by Emperor Yao. During her husband's absence, Chang'e, noticed a white beam of light beckoning from the rafters, and discovered the pill. Chang'e swallowed it and immediately found that she could fly. Houyi returned home, realizing what had happened he began to reprimand his wife. Chang'e escaped by flying out the window into the sky. Houyi pursued her halfway across the heavens but was forced to return to Earth because of strong winds. Chang'e reached the moon, where she coughed up part of the pill. Chang'e commanded the hare that lived on the moon to make another pill. Chang'e would then be able to return to Earth and her husband. The legend states that the hare is still pounding herbs, trying to make the pill. Houyi built himself a palace in the sun, representing "Yang" (the male principle), in contrast to Chang'e's home on the moon which represents "Yin" (the female principle). Once a year, on the night of the Mid-Autumn Festival, Houyi visits his wife. That is the reason why the moon is very full and beautiful on that night. Another version of the legend, similar to the one above, differs in saying that Chang'e swallowed the pill of immortality because Peng, one of Houyi's many apprentice archers, tried to force her to give the pill to him. Knowing that she could not fight off Peng, Chang'e had no choice but to swallow the pill herself. Other versions say that Houyi and Chang'e were still immortals living in heaven at the time that Houyi killed nine of the suns. The sun birds were the sons of the Jade Emperor, who punished Houyi and Chang'e by forcing them to live on Earth as mortals. Seeing that Chang'e felt extremely miserable over her loss of immortality, Houyi decided to find the pill that would restore it. At the end of his quest, he met the Queen Mother of the West, who agreed to give him the pill, but warned him that each person would only need half a pill to regain immortality. Houyi brought the pill home and stored it in a case. He warned Chang'e not to open the case, and then left home for a while. Like Pandora in Greek mythology, Chang'e became curious. She opened up the case and found the pill, just as Houyi was returning home. Nervous that Houyi would catch her discovering the contents of the case, she swallowed the entire pill, and started to float into the sky because of the overdose. She kept floating until she reached the moon, where she stayed with her pet rabbit, also known as the Jade Rabbit. Some versions of the legend do not refer to Houyi or Chang'e as having previously been immortals and initially present them as mortals instead. There are also versions of the story in which Houyi was made king as a reward for killing nine of the suns and saving the people. However, King Houyi became a despot who either stole a pill of immortality from the Queen Mother of the West or learned that he could make such a pill by grinding up the body of a different adolescent boy every night for a hundred nights. Chang'e stole the pill and swallowed it herself, either to stop more boys being killed or to prevent her husband's tyrannical rule from lasting forever.